First look at rendering of upcoming Harlem restaurant, Vinateria | HarlemGal Inc.
A few months ago we told you about the upcoming Harlem restaurant, Vinateria, which will be located at 2211 Frederick Douglass Blvd. and 119th Street. 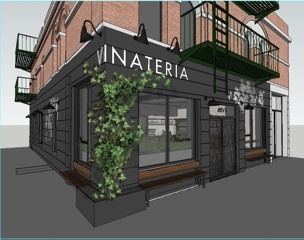 This Harlem blog has an update with a FIRST look at the rendering of Vinateria! Take a look above! This is how Vinateria will eventually look. Pretty cool…huh? I have seen the inside of Vinateria Harlem and what I can tell you is that this new restaurant will have a nice big chocolatety/brown bar to the right when you walk in with gold-plated hanging sconces over it. The rest of the place is in full construction, but it is coming along. “We will offer a wine list hand-tailored by our in-house wine connoisseur and designed to complement our skillfully prepared menu. The food will be every bit as interesting as the wine and will tantalize with more than a few twists and turns on comfort food favorites that range from appetizers available at our bar to main courses and deserts,” says Yvette. Their website is coming soon as well. Here is their landing page. 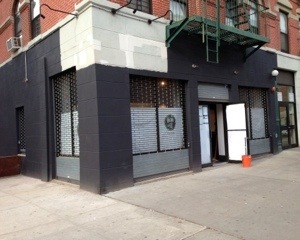 So there you have it.The first look at Vinateria in Harlem! Mark your calendars! Vinateria is coming to Harlem’s restaurant row soon! This entry was posted in Bars, business, drinks, food, Frederick Douglass Blvd., Harlem, New York, New York City, NYC, restaurant row, restaurants and tagged 10026, 2211 Frederick Douglass Blvd., 2211 Frederick Douglass Blvd. and 119th Street, dining out, eating out, Food, Harlem's Restaurant Row, house wine, new restaurants, restaurant row, restaurants, seasonal cuisine, Vinatería, Vinatería Harlem. Bookmark the permalink.